Stuart Diamond in his studio. Back in 1970, the atonal trend established among contemporary classical composers In the '50s continued to cool music scores. 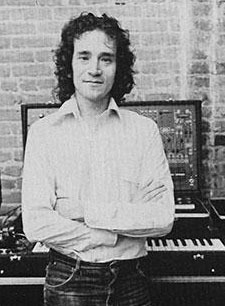 But Stuart Diamond, maverick or oblivious, was busily penning romantic, melodic compositions - and plugging them into his synthesizers. The result was a music that was indeed far out ("a wonderful trip into the asteroids," according to Variety), but in no way distant or detached. The Diamond difference may have some thing to do with the intent behind his composing. We talked about It in his Manhattan music studio - a completely non-classical room spilling with masses of wires, buttons, and levers. "My concern," says Diamond, pushing back his wire-rims with his thumb and middle finger, "is to bring the audience to a philosophical position as a result of listening. I'm more concerned with that than with grinding a stylistic ax. Once you've hooked an audience's imagination you can take them on a journey in such a way that creates certain images. You can bring them to various emotional effects, including a feeling of transcendence. To be able to accomplish this is the art, and that's what music is about for me." "I try to be very positive in my statements. I used to write negative pieces, then somewhere along the line I began to write positively - just an expression of what I wish to express in general in my life." Diamond says he's always been a romantic and melodic person. he started playing wind instruments at age 9, and from that point on was very conscious of line. At age 18 he began composing: "The first thing I wrote was a title page: 'Stuart Diamond, Symphony No. 1. I never got beyond the first movement of that one. It was dreadful, of course. But it did have a strong melodic line." After six years at Haverford and Sarah Lawrence, Diamond plunged into New York's Lower East Side and took it by - well not exactly by storm. In fact, his first two years were touch and go. "I played bassoon professionally, and wrote music textbooks and magazine articles to support my composing. What a way to spend my youth!" he chuckles, slapping his forehead, crooking the wire-rims. "But things got better. There I was, struggling to squeeze in a couple of hours of composing a day when, out of the blue, I was discovered by the Criterion Foundation. Criterion had been looking for composers different from the academic tradition. A friend of mine played a tape of my music for some foundation people and as a result they offered me total financial support or several years. The grant came to me out of the sky. I hadn't even applied for it. A little Cinderella experience."